LG has finally announced their latest flagship - the LG G2. the phone has an ultra-slim bezel and the lacks any hardware keys on the front.The only hardware key is actually positioned on the back. It's actually a combo of several buttons in one. That's the power/sleep key dead center along with the volume keys. The volume keys also double as shortcuts for the camera and Quick Memo feature. The storage capacity is set at either 16GB or 32GB. along with a microSD slot for expandable storage The 13MP camera is on par with the rest of the top notch hardware. It's got optical image stabilization (OIS) and can record FullHD 1080p videos in up to 60fps. The LG G2 also has an Infrared port that can be used to remotely control home entertainment devices by learning from their conventional remotes. 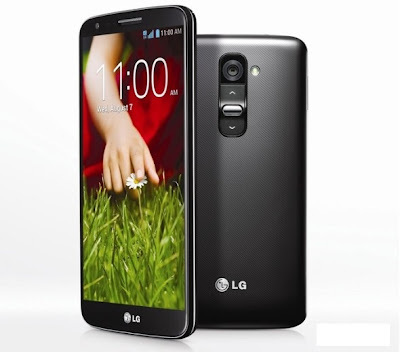 Connectivity-wise, the LG G2 makes use of the latest generation LTE-A connectivity (up to 150Mbps), as well as dual-band Wi-Fi and Bluetooth 4.0. For power backup, the LG G2 relies on a 3,000mAh Li-Po battery. the device sports a 5.2-inch FullHD display, the screen is slightly bigger than the current crop of high-end smartphones.The screen is a IPS unit with a brightness rating of 450nits. The LG G2 display uses something called Graphic RAM (GRAM) to reduce power consumption up to 26% when displaying a still image. LG claims this increases the expected overall battery life by up to 10%. As customary for Android flagships, the LG G2 offers several proprietary features to differentiate. You can double tap on the screen to wake it up and tap again to turn it back off. The phone will readily auto answer a call when you pick it up to your ear. There is an innovative Guest mode to secure the privacy of your data when friends want to check out your new smartphone or when you hand down your phone to your kid. Finally, you can get rid of a currently active app and minimize it by a three-finger swipe across the screen. Speaking of multi-tasking, the G2 can store your app progress in up to three different apps. The screenshotting feature can capture a whole webpage or a long email, not just the content in your viewport. This is an amazing phone and the price seems pretty good as well. I'm really looking forward to its release here in Australia. LG G2 comes with the fresh Qualcomm S800 which is quicker than the Qualcomm S600 on its Samsung and HTC competitor.